Roderick Insurance Brokers are proud to foster professional associations with leading insurance industry bodies, as well as local and community organisations. Please contact our Geelong insurance brokers to find out more. 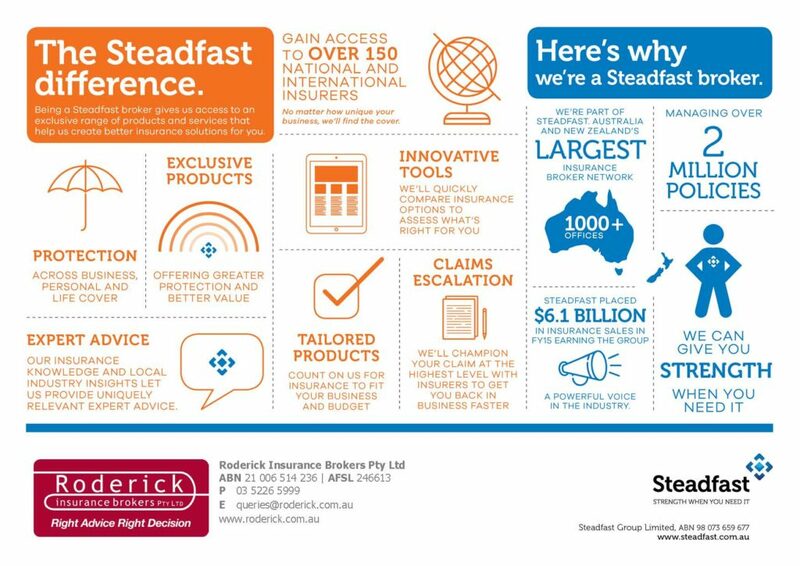 Roderick Insurance Brokers in Geelong & Werribee is part of the Steadfast Group, the largest insurance broker network in Australia and New Zealand. As a client of a Steadfast network insurance broker, you get the best of both worlds – local and personalised service in Geelong & Werribee, with the insurance expertise and support of a large organisation. As long standing members of the National Insurance Brokers Association (NIBA), we have shown our commitment to professionalism in our industry. NIBA is committed to the advancement of professional insurance broking and to the fostering of public confidence in brokers. Its leadership role in industry representation and in lobbying and government relations is well known and respected, as is its active promotion of high ethical standards. sets out standards for brokers to follow when dealing with clients, including requirements to inform clients of remuneration arrangements and any conflict of interest. We are members of the Geelong Chamber of Commerce, one of Australia’s leading regional business bodies boasting more than 700 members. We regularly attend Chamber functions and have found these opportunities beneficial in keeping informed of important business and industry issues.